We need your vote. Beginning tomorrow, September 25, 2018, please click on this link (note: the link won’t work until Tuesday, 9/25/2018) and vote for Muscle Powered to receive the 2018 NV Energy Power of Good Giveaway. The money will be used to conduct research along Secret Trail, identifying the most resilient native species of plants. 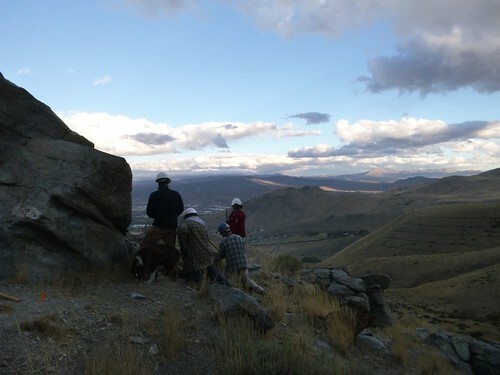 The findings will be shared with local and regional land managers to help benefit trail building efforts in the Eastern Sierra. You can vote once per day. Voting is only open for four days, so please maximize your voting potential and vote each day. Clicking on the image above will take you to the voting site. 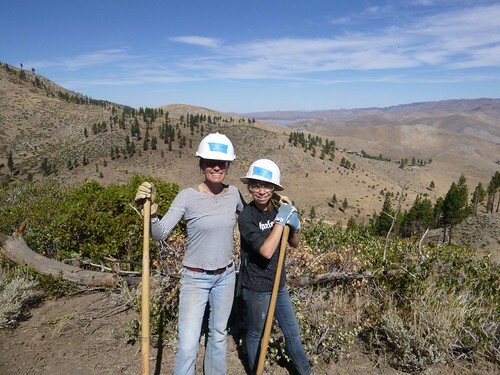 In keeping with our mission of building a more walkable and bikeable community, Muscle Powered, in partnership with Carson City Parks, Recreation, and Open Space, will conduct a reseeding project along a portion of Secret Trail in the Eastern Sierra foothills. Dr. Johanna Foster, an ecologist and Board member of Muscle Powered will lead the collaborative effort to analyze which native plant species are most successful at regeneration. 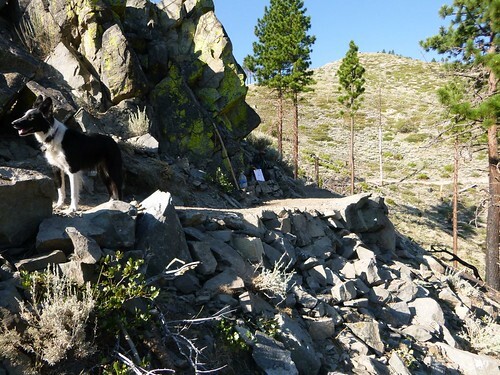 Research results will help land managers develop sustainable trail designs, and will be used for training and educational purposes with a goal of benefiting future recovery efforts on local trail systems. We started the season off in April working a couple of days on the Carson River trail located at the Morgan Mill boat ramp. 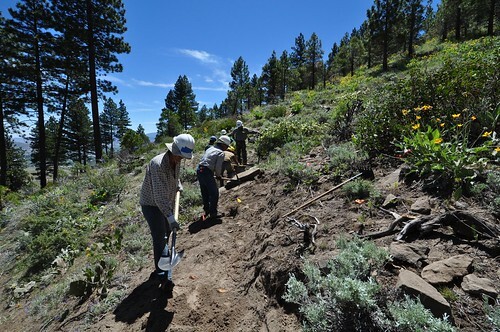 Muscle Powered volunteers built 1200ft of trail along the Carson River connecting the boat ramp to the Deer Run Rd bridge. 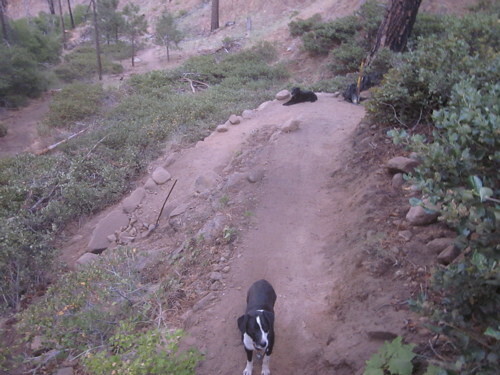 The Ash Canyon to Kings Canyon trail season started May 1st. May had us finishing up where we left off in 2012, completing the OliMax rock and building up to Tomanda’s Beer Rock. It was also good to see Jeremy Vlcan from CVTA take time from his busy schedule to help us on one of our first evening work nights of the season. We also had a big win in May. Muscle Powered was awarded top honors in the RTP grant 2013/14 cycle. We requested $10,000 for the purchase of tools, but were given an additional $2500 for more tools. $12,500! Sweet! Thank you Jenny!!! National Trails Day kicked off June with 28 people showing up to build trail. 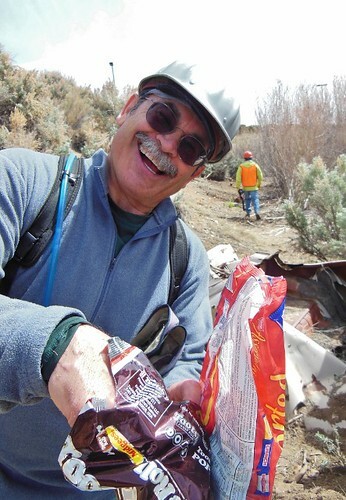 We saw a lot of familiar faces, as well as new ones, this day but it was especially “cool” to have Parks & Rec director Roger Moellendorf and Open Space manager Juan Guzman out on the mountain getting their hands dirty with us. 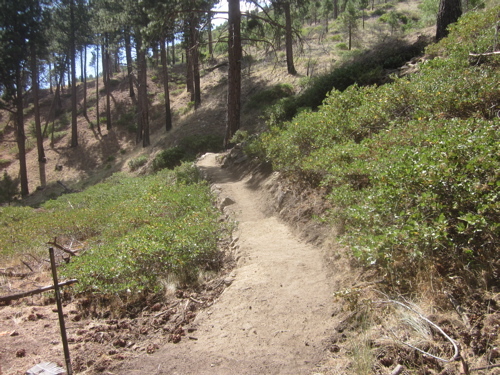 We built 500ft of trail on NTD!. Our biggest trail day to date! June was a busy month for us as we had Redrock Dental, TAMBA and Troop 16 join us for a few hours of quality work. We also hit the 1 mile mark at the end of June. In July we made it to 4th of July Rock. Named after the day we started construction around the rock. Oli and Ward set the keystone, and 5 weeks later it was completed. It could be the longest time we’ve spent in one location. (Turns 1 and 2, and the wall connecting them, and the Big Ravine, both took 4 weeks to build). Oliver Lieder starting construction at 4th of July Rock. Once past 4ofJR things moved a little quicker, and a gentle slope helped. Then there was the Rim Fire. Bringing smoke into the area which created unhealthy work conditions. Volunteer turnout lowered to 1-3 individuals for about 3 weeks. The City is barely visible through the smoke. 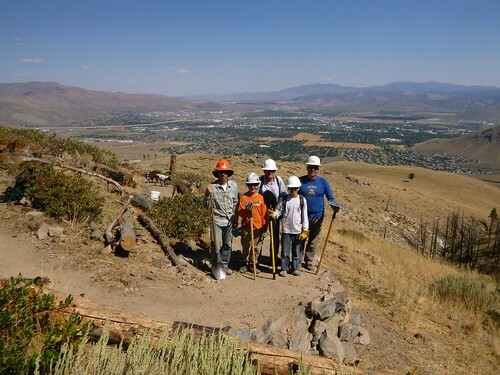 By September crews reached the Carson City viewpoint. 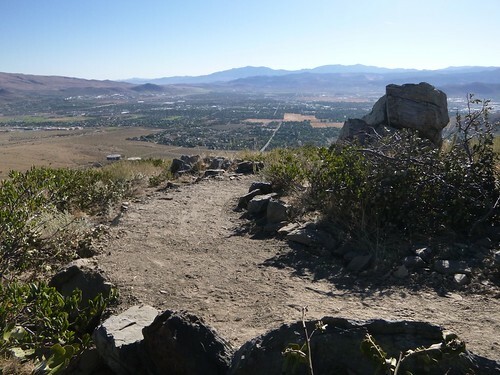 The view point is located between Ash Canyon and Taylor Spring and gives trail users their first full view of the city. To fulfill our grant match requirement from the RTP awarded to Muscle Powered in May, crews worked on a few of the turns built by the NCC crew in August. The turns were well constructed, we just needed to tweak them a bit. We added another rock layer to the lower leg of the turn and increased the radius of the upper leg, making the turns resemble our turns in Ash Cyn. By mid September the smoke had cleared and volunteer turnout increased greatly. At the end of the month we made it to the saddle between Ash Cyn and Taylor Spring, and the start of an old roadbed. Nate Harrison, Conner McCrae, Robert Rigsby, Tobin and Brian McCrae. October was all gravy. I thought we would make it to the saddle by the end of the season but because of all of our great volunteers we were a month ahead of projections. 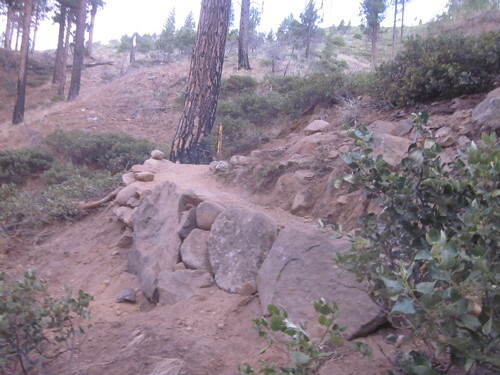 Utilizing the old roadbed as part of the trail alignment really helped things move fast and the Tahoe Mountain Milers helped make that happen. TMM helped throughout the season but really pulled through in October. Thanks TMM! The Bike Smith day was a huge success! We had 25 people turnout to help build 450ft of trail on a steep cross slope. It was great to work with the guys from the shop. We’ve been talking about organizing a workday for a while but weren’t able to make it happen ’til the end of the season. I’m looking forward to more TMM and TBS workdays in the future. Our last big day of construction was a TAMBA/MP build day. 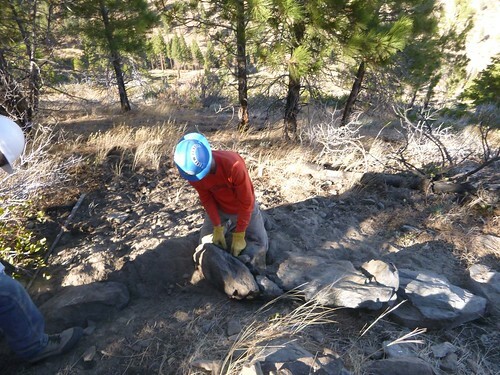 We had 17 volunteers help build one rock wall, finish 300ft of trail, and start construction of the lower leg of the next turn. It was great to have TAMBA’s Kevin Joell on the last day guiding us through our first switchberm. TAMBA’s Kevin Joell placing rocks on the lower leg of the switchberm. Shannon and Chloe Hataway on the old roadbed. In June our retired crew, led by Ward knous, continued construction (started last year by Troop 16) on the private property section off Waterfall Rd. They would build once or twice a week through the rest of the season finishing approximately 600ft of trail. There is about 1200ft left to complete to connect the two NCC sections. Nice work guys! Retired Crew – Alan, Kevin and Ward scouting for future connections. Top Dog Robert Rigsby modeling the safety glasses donated by Eagle Vision. 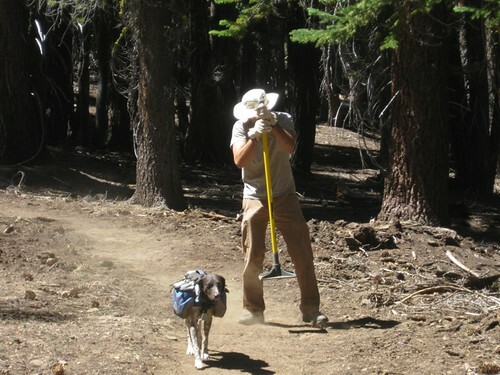 We had a very successful National Trails Day on the Ash to Kings Canyon trail. 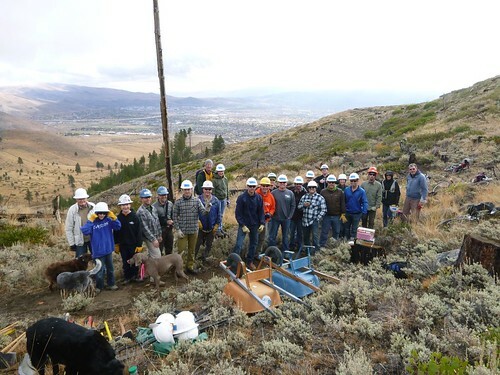 24 volunteers attended the event and constructed 500ft of new trail. Galena Fest provided a delicious lunch, and Cliff Bar donated bars to keep us fueled throughout the day. Adventure First Aid Kits proved freebies for the volunteers as well, fortunately we didn’t have to use any of their products during the day. Muscle Powered wrote a successful grant which received top honors from the RTP Advisory Committee. The grant will provide much needed tools to assist Muscle Powered in completing the Ash to Kings Canyon Trail faster and safer. 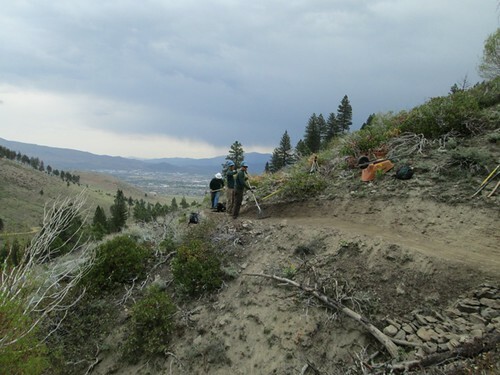 The tools will also help us maintain current trails and build new trails in the Carson City area ( crews are surveying a link from the Ash to Kings Trail up to Hobart Res). Thank you Jenny! Muscle Powered is very pleased to join TAMBA in an Ash to Kings Cyn evening work party on Friday, June 14th. This occasion is very special as it is the first chance we’ve had to organize an Ash/Kings workday with this outstanding organization. We’ve worked with TAMBA in the past on the Hobart Link Trail and we’re fortunate that we’ll be working with them again. Where: Ash Cyn Rd, just above the water tanks. 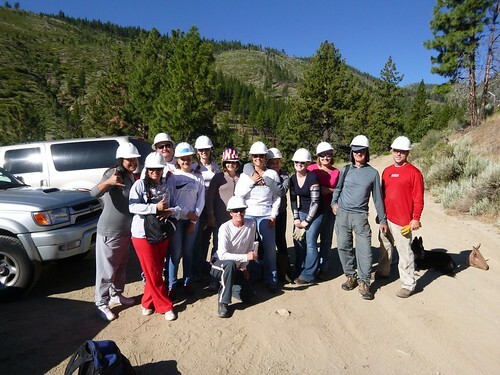 After sign-in and safety talk, we’ll hike to the worksite which is 3/4 mile from the upper Ash Creek trailhead. Depending on the turnout, work may consist of clearing, grubbing, casting, rock work, finish work, or all of the above. Afterwards we’ll kick back at the tailgate and discuss future projects, trail access, favorite tools, or we’ll just solve the world’s problems over refreshments. Please RSVP jeffpotter@musclepowered.org if you plan on attending. It’s recommended that you bring water and snacks so you stay hydrated and strong while working. NCC crews started work on the upper portion of the alignment on May 27th. This is a rocky and challenging area and they’re doing a fantastic job building “sweet” single-track. 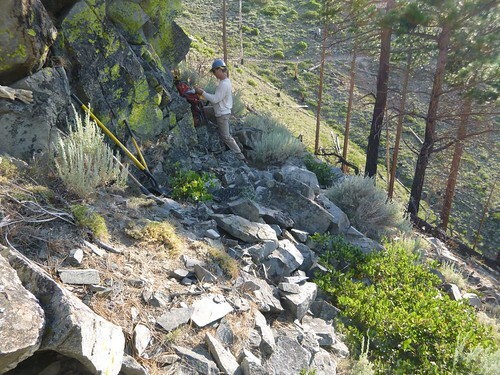 Crews are scheduled to work full time on the trail thru August. I don’t expect Muscle Powered crews to connect to the upper trail until next year. Though the more volunteers we get the sooner we can connect. You chicks on bikes! 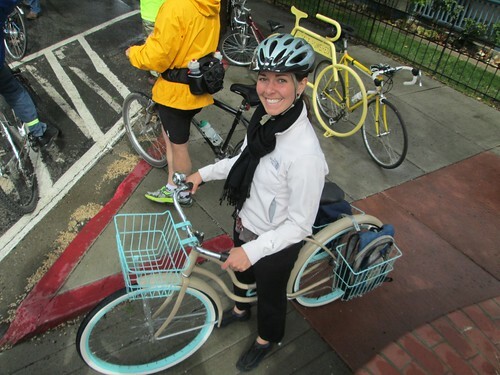 You know who you are–go to the May 23 Women’s Bike Clinic at Bike Habitat. Denis Coyne always organizes a great program. Go early, as it is usually a full house. Great tips for simple repairs. Get a little know how and more. Then on Friday, May 24, at 6 p.m., First United Methodist Church in Carson City, get ready to join writer-photographer-adventurer Rick Gunn for his 90-minute presentation “Soulcycler, Words And Images From a 25,811-Mile Bicycle Journey Around-The-World.” ”Soulcycler” combines 350 breath-taking photos from 33 countries, set to music, accompanied by a selection of uniquely emotional stories from around the globe. Gunn delivers a front-row seat to the pursuit of his lifelong dream of cycling the planet. See Bike Carson’s post HERE. 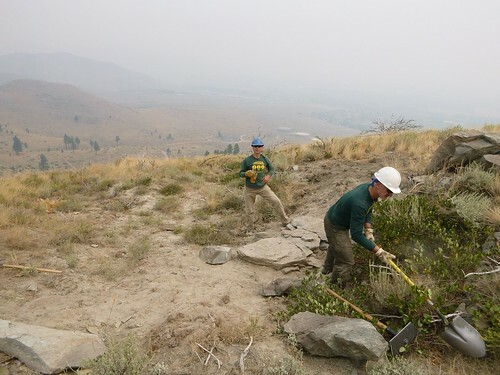 First United Methodist Church – 212 N Division St.
Help Muscle Powered celebrate National Trails Day by building trail on the Ash Canyon to Kings Canyon Trail. 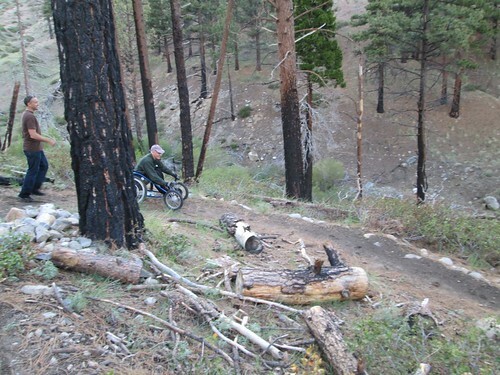 Scheduled to be completed in 2014, this 7 mile multi-use trail will connect Ash and Kings Canyons, providing users with a scenic backcountry experience only minutes from downtown Carson City. For registration and details click HERE. 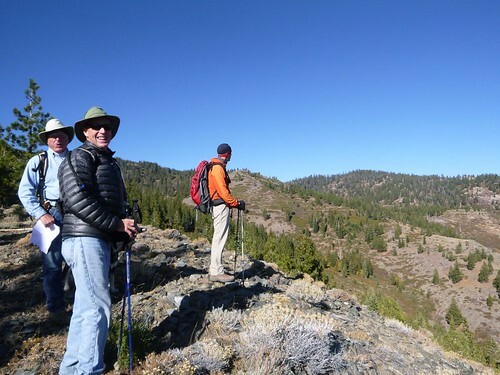 American Hiking Society’s National Trails Day® will bring together outdoor enthusiasts across the country on Saturday, June 1, 2013, for the 21st annual celebration of America’s magnificent trail system and its countless supporters and volunteers. Over 2,000 nationwide events will take place including trail maintenance, hiking, paddling, biking, horseback riding, bird watching, running, trail celebrations and more! On August 2nd Open Space Manager Juan Guzman presented the Cooperative Agreement between Muscle Powered and Carson City to the Carson City Board of Supervisors for approval. 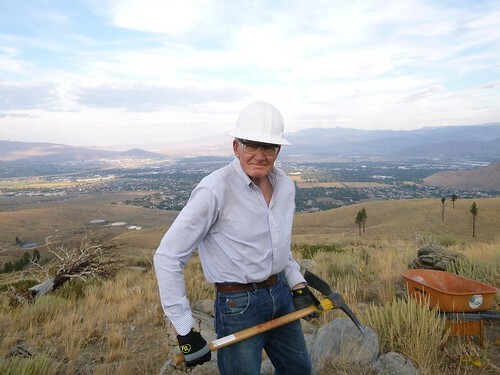 Included in the Agreement is that Carson City will provide workers compensation for volunteers working on City land. The Agreement passed with a unanimous vote, with Mayor Bob, Shelly Aldean and Karen Abowd praising Muscle Powered’s efforts. 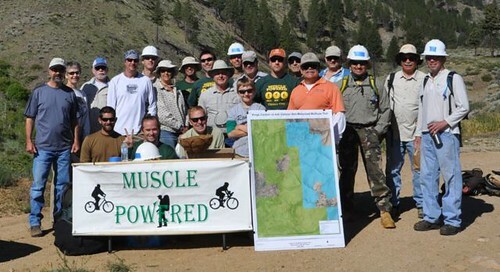 Muscle Powered signed a Volunteer Service Agreement with the U.S.F.S in June and Muscle Powered crews have been building trail on U.S.F.S land since June 29th. Our crews have been working on a difficult section of trail preparing a safe route for volunteers to get to the work site. We should have this section finished by next week. 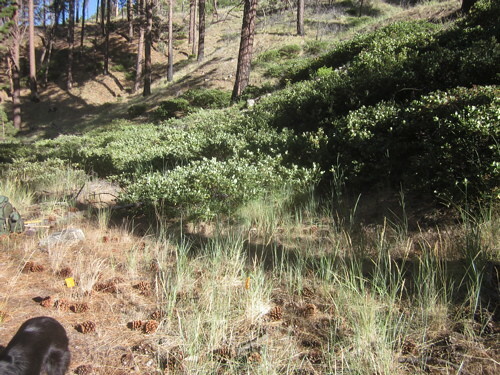 The Great Basin Institute (NCC Trail Crew) will start building trail on August 6th. Construction will begin at the top of Waterfall Rd and work north towards Ash Cyn. They’re available for two weeks, with the possibility of working an additional week at the end of August. This will give NCC crew leaders an idea of what to expect for next year’s build season. The winners of the Muscle Powered Trail Construction Scholarships are: Todd Erickson, Cortney Bloomer and Eric Ziegler. The scholarships were made possible by Muscle Powered and a generous donation from the Bike Habitat. Including the three individuals mentioned above we will have six TRTA trained crew leaders at the end of May. I believe this will be enough to get us well on our way when we start construction on the Kings Canyon to Ash Canyon Trail in late spring. 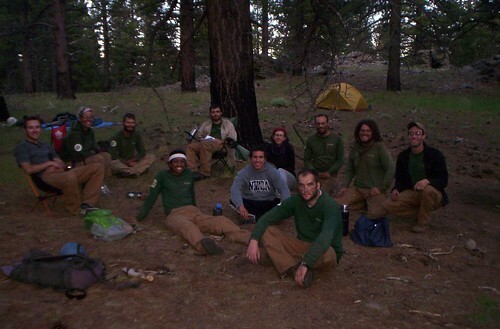 Muscle Powered is offering three scholarships to qualifying members to attend the Tahoe Rim Trail Association’s Track 2 Crew Leader Training on May 19th & 20th. (Friday’s Design & Layout Course is not included in the scholarship). Though not necessary to apply, scholarships will be awarded to those with the most trail building experience first. Trail Standards, basic construction techniques, tool use and briefing, leadership, safety and crew administration. You must be over 18 years of age and a current member of Muscle Powered. To fill out the application form please click on the link below. Name, address, email and phone#. How many years have you been a member of Muscle Powered? 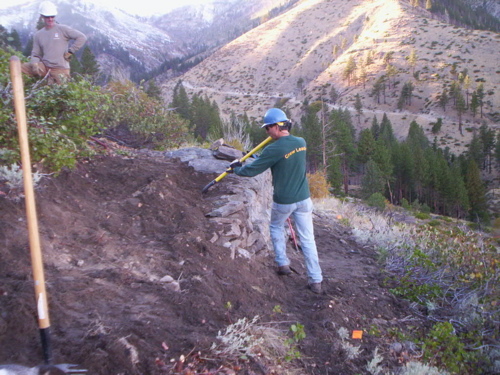 List other qualities,skills or experience you may have which you think would benefit a trail crew. Briefly describe why you would like to attend the crew leader training course. Application deadline is April 4th.